NEW YORK/LONDON (Reuters) - Gold prices rose on Monday as the dollar eased, but gains are expected to be muted ahead of inflation data from the United States later this week that could mean U.S. interest rates rise faster than expected. Spot gold was up 0.5 percent at $1,323.16 an ounce by 2:26 p.m. EST (1926 GMT). It has fallen more than 3 percent since hitting a 17-month peak at $1,366.07 in January. U.S. gold futures settled up 0.8 percent at $1,326.40. "The story is and will be about U.S. monetary policy and dollar direction," Julius Baer analyst Carsten Menke said. "U.S. growth is more solid, wages are rising and the worry is the Fed will be forced into more rate hikes than currently expected." A weak greenback makes dollar-denominated gold cheaper for holders of other currencies, potentially boosting demand. 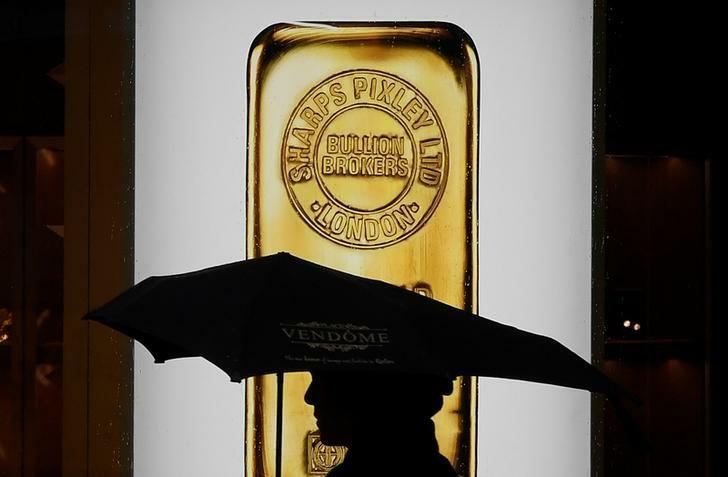 "In the short term, I would expect gold to react more directly to the fortunes of the U.S. dollar, customarily its strongest driver," said Tai Wong, head of base and precious metals trading at BMO Capital Markets in New York. "COMEX gold saw significant long liquidation according to CFTC data just through last Tuesday and gold bulls are reinstating long positions as markets have apparently normalized." Silver gained 1.2 percent to $16.55 an ounce, platinum added 0.7 percent to $971.50 an ounce and palladium was up 1.1 percent at $986.97 an ounce.